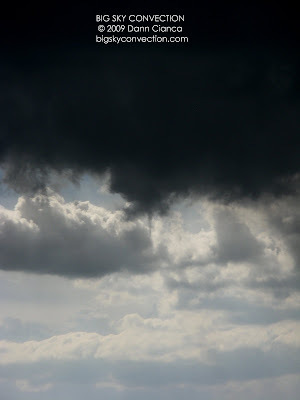 ... but I got off work at 4PM, hit 225 (which was a mess as usual) and saw some ... "interesting" structure to my north. I needed gas, so I stopped and got some and then looked at the radar, seeing a nice cell forming on the north side of the Metro. I got on Peña Boulevard and then northbound on Tower Road when it went tornado-warned. I had a great view the entire time, though I did not see the funnel that prompted the warning. 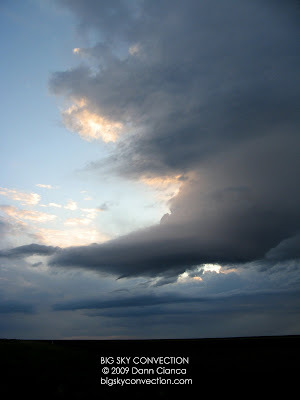 I did see several needle funnels in the scud which was rotating at a moderate pace along the skirt of the wall cloud. Family members in Thornton reported the sky "swirling overhead" also at the time. Someone reported a tornado 4NW Firestone at 231Z which boggles my mind as 4NW Firestone was deep in a core at 2311Z. I would love to see more info on that one. I followed the storms north on I76 and then north on Kersey Road to US 34. I saw a couple instances of lowerings and rotation, but everything became a convective mess. I headed east to Wiggins to get a better view and then saw a bit of convection on the southeast horizon, so I continued on I-76 to Brush, where I headed south. I was about to call it a day and head back to Denver, but the convection to my southeast was continuing to look robust, so I drove east on 36. 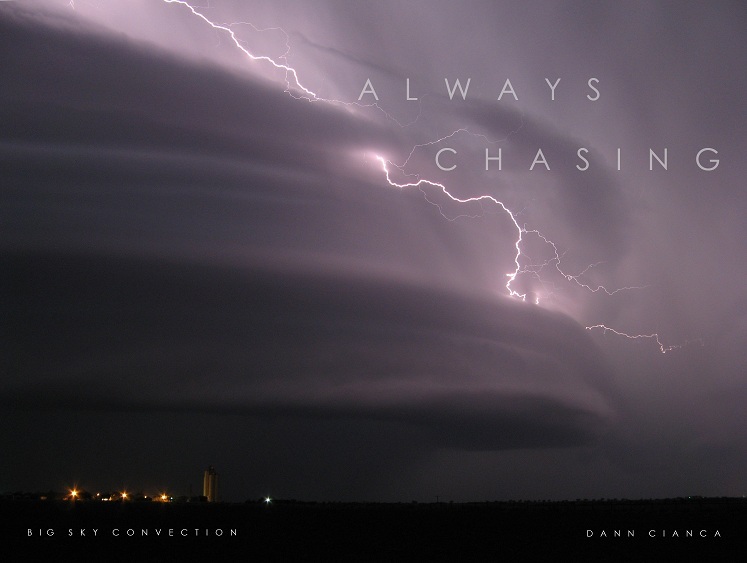 I knew that this storm had no chance given that the air at the surface was COLD and not inflow ... it was obvious that the storm's base was elevated and had no connection to the surface. 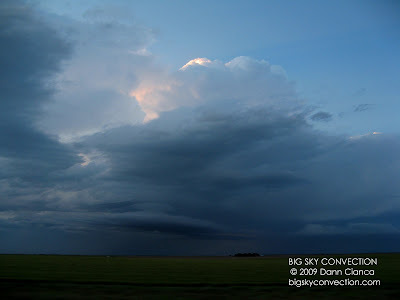 This was true of another storm further to the east (seen below). I continued south on CO 59 and cored a new severe cell (from the robust convection I noted earlier) just north of Seibert. It contained (at least) 0.88" hail in the main core and possibly 1" hail on the outskirts of the rear flank. I stayed ahead of the storm on I-70 (eastbound), periodically stopping to try and take some pictures. 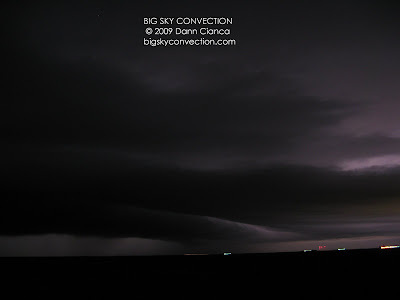 Nothing really turned out and I was unable to detect any significant structure to the severe storm. After some dinner in Burlington (the storm had weakened), I started to head home. Lightning in front of me prompted me to check radar and I saw a new cell developing just east of Limon. 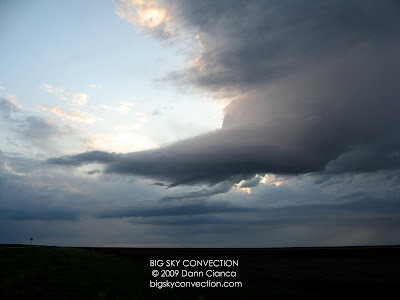 I intercepted the cell at Arriba (I drove south a mile or two on dirt for a better vantage). The rear flank gusted out, creating a nice shelf cloud. When it arrived, it contained wind-driven 1" hail. I called this one in. The Weather Service was VERY CURIOUS as to whether I saw any rotation in the storm. I don't chase with data (except for my phone), so I was a little blind. I didn't see any rotation ... just the RFD shelf. Passed another (eventually severe) cell near Limon and then headed home. Not a bad day. Intercepted a tornado-warned storm, two severe-warned storms ... saw (at least) three funnel clouds, a nice LP-sculpted meso, had 1" hail twice, and the lightning was great as always. Sounds like a lot more fun than was had in Kansas today! Careful with that first pic, you might poke an eye out with that! ;) Just kidding, good for you on your latest, really dig your last scene. You have been so busy I am getting behind on the adventures! Nice season you are having there, I am getting pretty jealous. Beautiful photos again Dann, they sure help to fend of the shakes. Paul: Honestly, it was more impressive than the photo shows. It came out better on video anyway. LOL Thanks, man. Tony: Looks like you got back for some of the home-town action! ... and got as much as I did. lol Bah! Pat: I know ... I can hardly afford it! Thanks man ... glad you're finally getting some convection up in Albertasaurus.